A reasonable lead from the US overnight has helped Aussie stocks end higher, despite the BREXIT turmoil continuing. The local market briefly traded below par early in the session but managed to close 30 points above the day’s lows to close on the high of the day. Banks were the well supported and so were the tech names which followed the NASDAQs overnight move. Resources weren’t so lucky today despite some positive moves in commodities overnight on the back of Eurozone & China stimulus announcements. 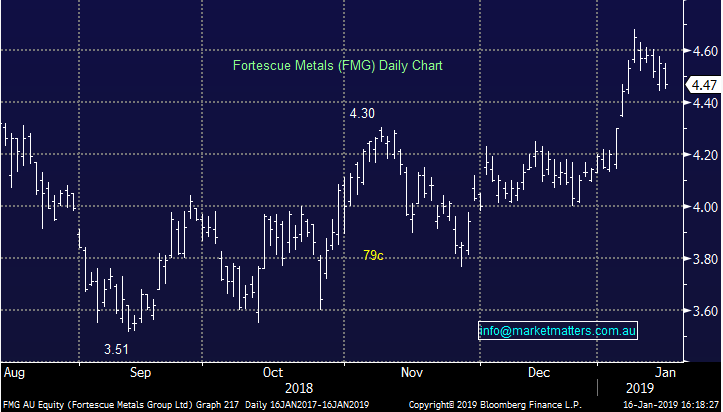 Gold names were hit particularly hard – Newcrest (ASX: NCM), Northern Star (ASX: NST) & Regis Resources (ASX: RRL) all finished more than -1.5% lower. Today we gave out our view for income paying securities in the Income Report – click here to read – as well as our outlook for the year ahead in the morning report – click here to read. 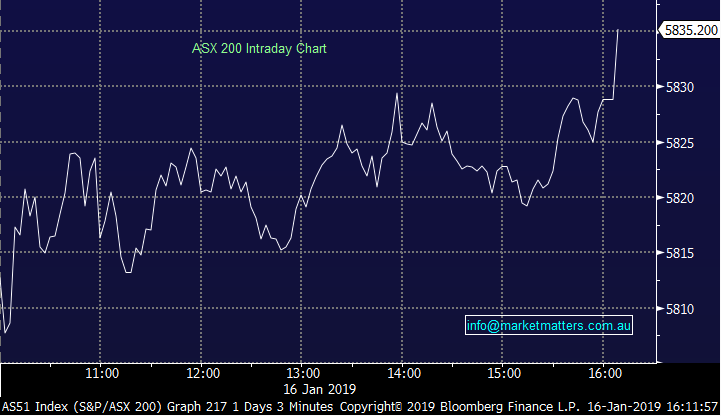 Overall today, the ASX 200 closed up +20 points or +0.35% to 5835. Dow Futures are currently trading up +55pts or +0.23%. Broker Moves; CLSA were busy in the resource names today, particularly focussing on ore picks as they look for exposure into China. Recent China growth has been soft however the government has begun stimulating the economy in an effort to restore the growth rate. They also argue the benefits of holding resources at a time when there are many global macro headwinds about. 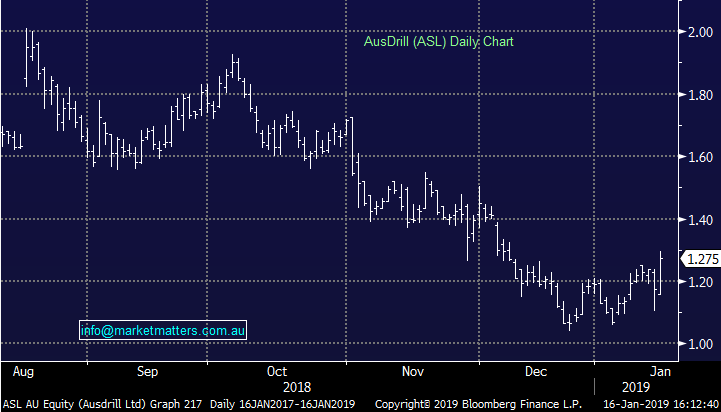 Ausdrill (ASX: ASL) $1.275 / +8.51%; yesterday’s worst is today’s best as mining services company Ausdrill bounces back from yesterday’s woes. Yesterday the company announced the resignation of the groups CFO Theresa Mikota, as well as a notice that major shareholder The Central Bank of Norway had sold a part of their holding. 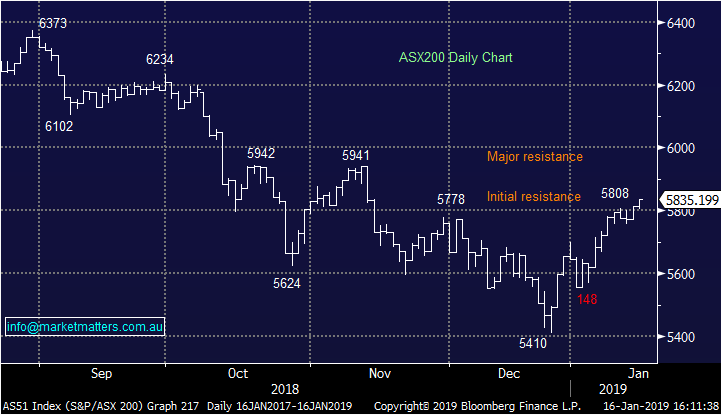 The dual announcements sent the stock down -5.24% on the day, however ASL staged a recovery today to more than offset the fall. Not one we are currently looking at but the stock has bounced well off bad news, and from recent lows in December.